A presentation of cityborg, "a digital interface with our world," and some related creative projects that will use the cityborg distro -- mobile computer, kinetic sculpture revisited by technology and greenbots, ecologist artbots -- or develop cityborg itself -- social networks generator --. 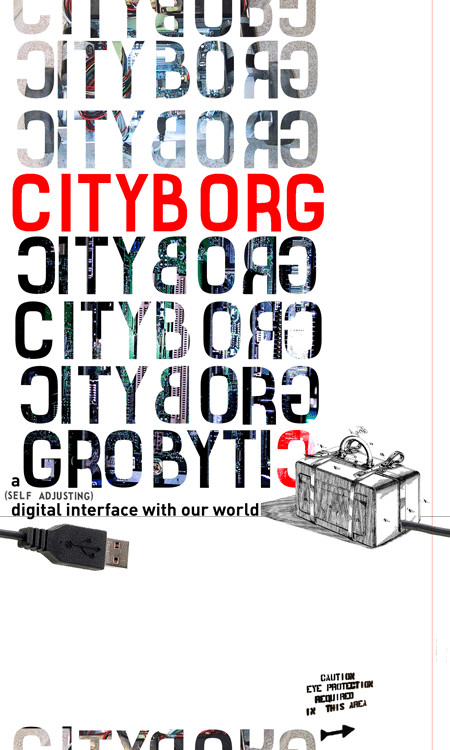 "cityborg is a cultural project oriented to build a digital open platform to generate social networks in our mediated environments. our open basis are the cityborg distro, a gnu/linux distribution, and the related internet node, cityborg.net. the roots of cityborg are nurtured by the energy and growing dynamics of 'collective of collectives' in barcelona' underground. in this 'primordial soup' we feel the need for a new cultural tool that synthesyze and contribute to the new cultural movement (free software, urban explorers, diyers, hackivists...)." >from *cityborg*. "The work we are producing is a hanging mobile, or kinetic structure, that is suspended above the audience, and consists of a number of functional motherboards (nodes). Each of these nodes processing data instructions from a controlling computer (root). The results of this network of computers (cluster) will be the delivery of their combined calculations in a visual projection of imagery. We believe that computer parts & components are un-recyclable waste products. We have noticed how commerce is discarding it's 'depreciated' computer equipment to be replaced by new generation computers that are faster, with larger hard drives and newer technology, which will again be thrown away within the following three to four years. These upgrades are required and completely justified, as software and operating systems inflate in size, demanding more powerful equipment to maintain fundamentally the same level of productivity. "Artbots are small robots able to develop some type of creative activity, or also, can be considered by themselves artistic pieces due to the way in which they are constructed, within which already is call 'robotic art.' Many types exist and unimaginable forms, thus, but the popular ones are artbots painters and musicians. Like the dorkbot community, exists an important world-wide community around artbots. For this reason from dorkbot Barcelona we are interested to contribute something new to this world-wide project. > 'i see what i see not' by tim otto roth. exploring the images of astronomy and elementary particle physics -- the most distant and next boundaries of the cosmos--, in the world's first facade which can be fashioned via internet.